initiative. While there, we asked about some of the paintings on the wall. When we got to a large portrait of a regally dressed woman, our host said “and of course, that’s Lady Lovelace.” So much of world history leaves out or minimizes the contributions of women, and so “of course” most of us had no idea who she was. You can imagine our surprise when we learned she was considered by some to be the world’s first computer programmer—having published the first algorithm intended for use on Charles Babbage’s Analytical Engine. After a chance encounter when aged 17, Ada became friends with Charles Babbage and grew fascinated by his idea to build an “Analytical Engine.” In 1843 Ada published a description of Babbage's machine. While partly a translation of an Italian work, Ada added voluminous self-penned notes, which made up the bulk of the document. Included in her notes were step-by-step instructions for how the machine could calculate a sequence of Bernoulli numbers, prepared in collaboration with Babbage. In effect, this was the world’s first published algorithm. Most importantly, the notes set out Ada's far-reaching vision for what the Analytical Engine signified. While Babbage saw it as a mathematical calculator, Ada understood it had much more potential. She realised it was, in essence, a machine that could manipulate symbols in accordance with defined rules, and—crucially—that there was no reason the symbols had to represent only numbers and equations. This was an astounding conceptual leap from calculation to computing. Ada envisaged a day when a single machine would be capable of a myriad of tasks, limited only by the creativity of its programmer. At the time—nearly a century before the first computers were built—it was a flash of brilliance. After our visit to Downing Street, we returned to the U.S. determined to learn more about Ada, and to revive her memory. Today, her birthday, is an apt moment. In addition to this post, Google is honouring Ada with a doodle in recognition of her prophetic vision for computing. Unfortunately, Babbage's machines were never built in his lifetime, and Ada's vision of computing was lost to obscurity for more than a century. It wasn’t until 1991 that the Science Museum London built Babbage’s Difference Engine from his original drawings. That machine is now on show there, and a second one is now at the Computer History Museum in California. Plans are now afoot to build a replica of the Analytic Engine—so perhaps Ada’s algorithm will at last be run on the machine for which it was intended. Ada's experience is sadly all too familiar. Too often, the contributions of women in science and technology are left untold, and to fade from view. While Ada’s story has been rediscovered, many others remain little known. That's why initiatives such as Ada Lovelace Day are so valuable, as a catalyst for raising the profile of women in science, past and present. Several wonderful biographies of Ada have been written already, and biographer Walter Isaacson has turned his attention to Ada as part of his next book. Visibility is also the reason why we launched the Women Techmakers series on GDL, to help shine a light on the roles and contributions of the many talented technical women in our industry today. We hope our series will complement other efforts to raise the profile of women, such as the new AOL/PBS supported website and documentary Makers.com or the work of Academy Award-winning actress Geena Davis on SeeJane to improve gender balance and reduce stereotypes in childrens’ television globally. We hope today's doodle inspires people to find out more about Ada, and about the contributions made by women in general to science and technology. Last year, a group of us were lucky enough to visit the U.K. Prime Minister’s residence at 10 Downing Street, as part of the Silicon Valley Comes to the U.K. initiative. While there, we asked about some of the paintings on the wall. 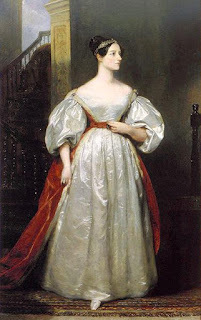 When we got to a large portrait of a regally dressed woman, our host said “and of course, that’s Lady Lovelace.” So much of world history leaves out or minimizes the contributions of women, and so “of course” most of us had no idea who she was. You can imagine our surprise when we learned she was considered by some to be the world’s first computer programmer—having published the first algorithm intended for use on Charles Babbage’s Analytical Engine.